Pelikan is adding another model to the successful historical M101N series, the M101N Grey-Blue. The technical base of this fountain pen is the model M101N. The chosen color pattern in grey and blue reminds of a historical model of the 1930s. The barrel is made of the typical Pelikan cellulose acetate in a very unique pattern. Cap, front part and turning knob are made of high-quality resin that polishes itself time and again during use. The typical Pelikan beak clip and the decorative rings are plated with palladium. Together with the fully rhodanized 14 carat gold nib it gives this special edition an elegant silvery appearance. This model comes with an attractive gift box & one bottle of royal blue ink. 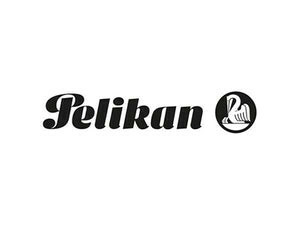 Both feature a special historic motif, which makes the set a beautiful gift for every lover of the Pelikan brand.